Lots of runner will tell you the most important piece of equipment for a runner is the shoe. While that is probably true, socks, which are often overlooked and forgotten, are a close second. What typically causes a blister? I’m sure you already know: moisture, heat, and rubbing. But I have good news. The geniuses behind our modern running technology have gifted us will a simple solution to beat the heat, removed the moisture, and prevent rubbing. The technology that goes into one of these little foot blankets is incredible, but with so many options out there, you need to know where to start. A moisture wicking fiber is crucial. Wicking away the sweat and water helps prevent blisters by keeping feet dry and cool. Set aside those wholly white cotton socks your mom bought you back in high school and look for synthetic and natural fiber (like wool) blends. 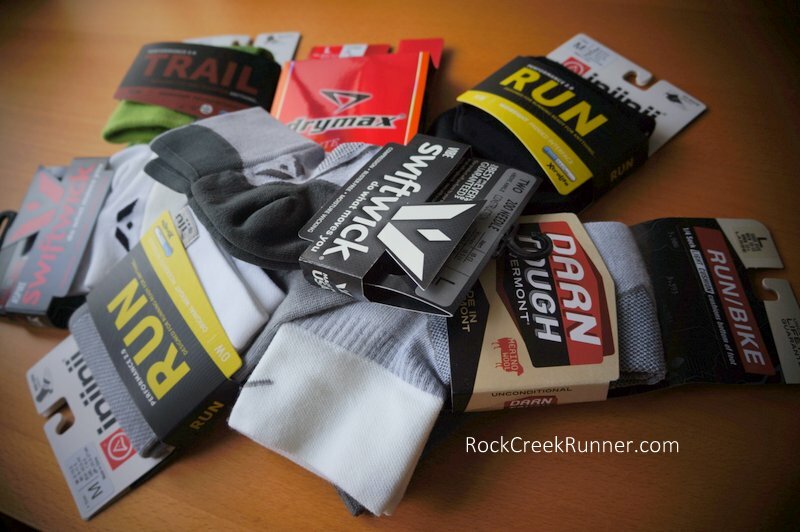 Running socks come in a variety of thickness levels. Test out thicker and thinner options, and socks that add thickness along the footbed, to find the sock that works best for you. After suffering through major blister issues this year, including one which lead to an infected toe and kept me from running long for a few weeks, I have been determined to find the perfect sock to keep my feet dry and happy. Without really knowing where to start, I did a little research and reached out to four leading running sock companies. DryMax, Swiftwick, Darn Tough, and injinji are putting out inventive sock technology that is helping runners perform comfortably every day. And I’ll be honest, I didn’t realize how cool socks could be until I started looking into these four companies. Over the past several weeks I’ve been putting these socks to the test. I’ve run dozens of miles in each pair, and the difference between these socks and a more traditional sock is socking (see what I did there?). Below I’ve shared some highlights on 4 pairs of socks for 4 separate companies, with the hope that you can find the perfect sock to keep youf feet happy and healthy. I first tried out the injinji Trail 2.0 sock during the Bull Run 50 miler back in April. I had been suffering from major blister issues during races earlier in the year, and was willing to try anything to protect my toes. And protect my toes these socks did. Even though it was my longest race of the year, my feet came out looking great. The 5-toe system helps to properly align your toes, promotes proper posture, and of course prevents blisters by keeping your toes dry and stopping them from rubbing. The first thing you’ll notice (after you get over the fact that you can see all 5 of your toes) is how soft they feel. Not only does the COOLMAX Polyester blend keep the toes dry, they are super soft to the touch. What stands out most about the Swiftwick Vibe is the compression aspect of these socks. I’ve never been big on the compression socks or leg sleeves (for no reason other than I’ve never needed them), but I am completely sold on the effectiveness of compression in these trail running socks. The compression helps prevent swelling by forcing blood flow back above the ankle. The lack of swelling keeps the feet comfortable and less irritated. On top of that, these thin socks have kept my feet cool and dry on some of the hottest days of this DC summer. I didn’t know it was possible to take a sock out for a 3 hour trail run and have it come out looking unused (albeit a bit more stinky) at the other end, until I took out these Darn Tough Run/Bike socks. They aren’t kidding. These socks are darn tough. The fully seamless design and Merino Wool blend makes this an incredibly comfortable sock. On top of that, I was immediately sold by the shape of the sock. Compared to similar socks, they designed it into more of an L shape, which felt incredibly natural around the foot. 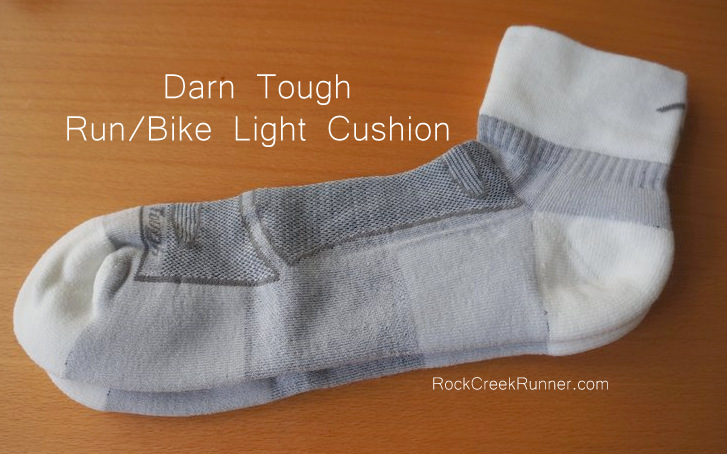 When a company is willing to back a product up with a lifetime no questions asked guarantee, like Darn Tough does with this sock, you know it is a product the company believes in. 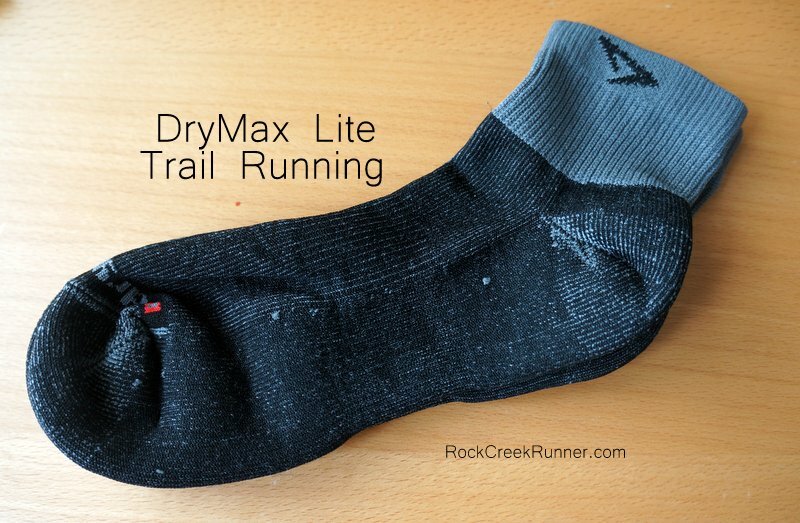 Coined “the first real running sock,” the DryMax Lite Trail puts specific features into this sock just for the trail runner. Their main focus for the trail runner? Keep the feet dry and dirt free. And these socks do an excellent job at it. The combination of dry feet, a seamless fit, and the added arch band make rubbing a blister nearly impossible. No wonder they claim to be the #1 sock to keep your feet dry. 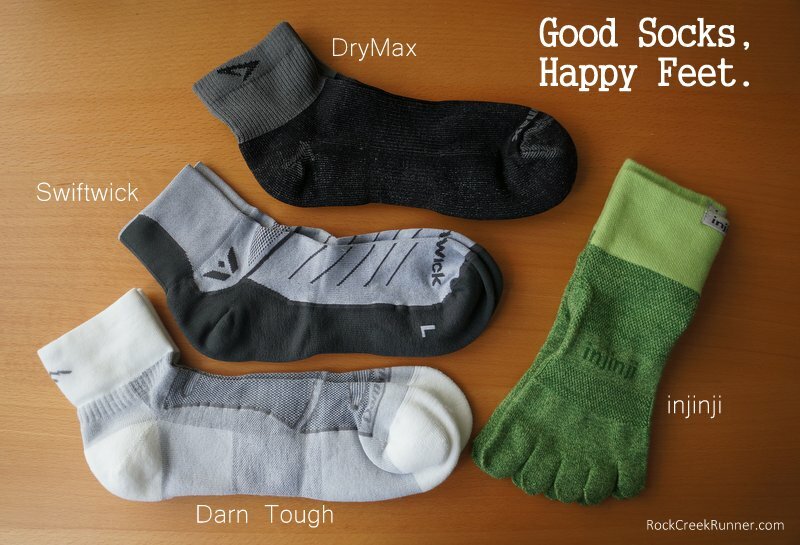 While a little thicker and less soft compared to some other options, these socks do exactly what they should. If you like a thicker sock, these are a good option for you. DryMax also offers a variety of warmer options for winter running as well. 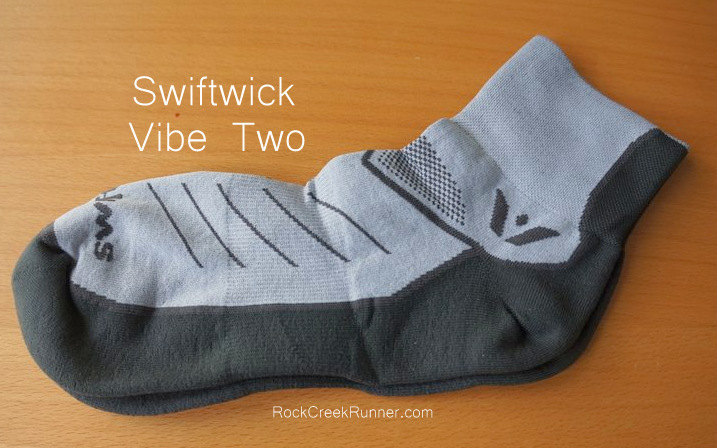 I may have to pick up some of the Swiftwick VIbe 2s. Like you, I haven’t had to use compression sleeves or socks, but I like the idea of these forcing blood flow back above the ankle. For some reason, I feel like my feet swelling on long runs have been more of an issue this year than others. These all seem like really good options! Thanks for the reviews. 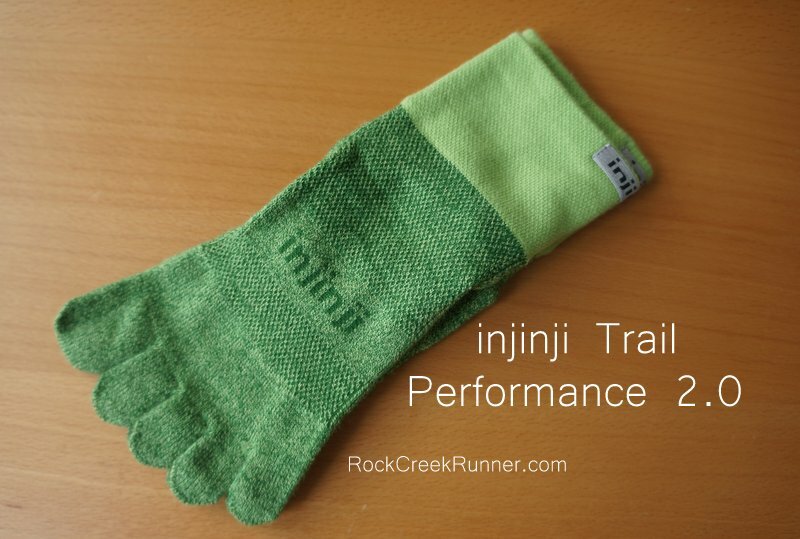 Very cool roundup… I recently got some Injinji socks on sale — I can’t wait to try them out. Because of this I’m looking into new running socks. I never realized how much they could make a difference. For me the injinji socks have more or less eliminated blisters; basically they prevent my toes from rubbing. However, they wear out insanely fast, so I just have to plan on replacing them often. It seems that after EVERY run, I’m left with a ball of yarn in the bottom of my shoes from the socks, and after a dozen or so runs, I invariably get a hole in the toes. That aspect of them is disappointing to say the least. I am thinking of trying a pair of 5 toe socks. Although you don’t mention it in the review, but I was wondering if you or your fellow trail runners had any experiences with blisters or skin burns due to the toes of the socks getting caught between the toes during a run?